Patchwork quilt made from squares of woollen fabric scraps from dressmaking. Squares are stitched together in no particular order. Colours are bright, with pink, yellow, green, brown and light blue predominating. Fabric is plain, checks and stripes. No padding or quilting. Backing is a cotton bedspread, striped in pinks and magenta. Made by Barbara McCabe while living in Geelong (VIC) in 1969, early 1970s. Owned by Barbara McCabe. 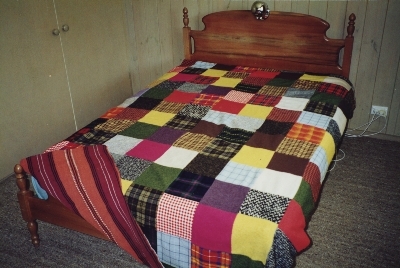 Barbara made a number of quilts in this style during the 1960s and early 1970s as bedcoverings for the family. When they ended their life as bed coverings, they were/are used as car boot liners, packing around furniture, etc. This quilt was made for her son, Michael.